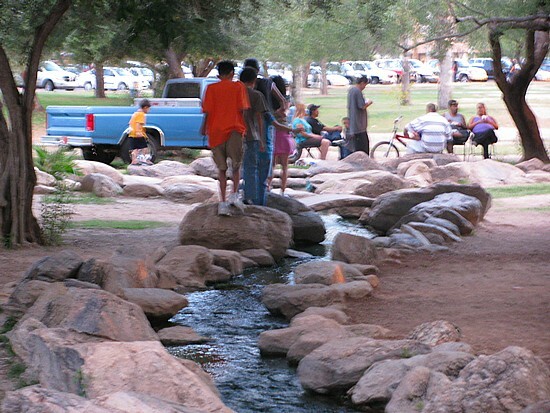 EMPS: Come to Tucson - In the Summer! For this week's Ellipsis Monday Photo Shoot #44:Travel Brochures, which I was too distracted to check out on Monday (more on this later), Carly wants photography suitable for a travel brochure, complete with a paragraph of promotional copy. I am sorely tempted to design a whole brochure as a PDF or something, but for tonight I will try for something a bit less ambitious. The cliche is true - up to a point. 110 degrees at 11% humidity is arguably more comfortable than 94 degrees at 90% humidity. 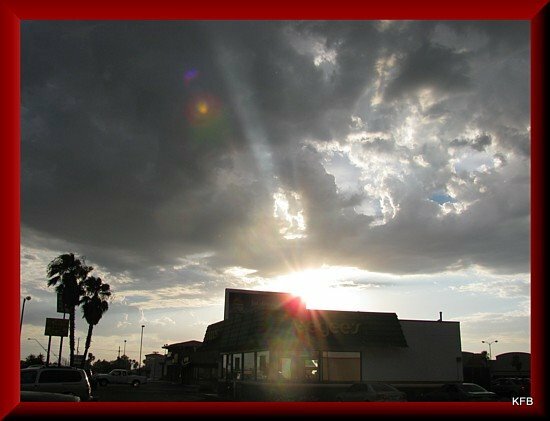 But when the monsoon arrives - Arizona's rainy season - the "dry heat" gives way to amazing cloud formations and dramatic thunderstorms. The high temperature is less extreme, and when the storm hits, the air may cool by as much as twenty degrees in a few minutes. 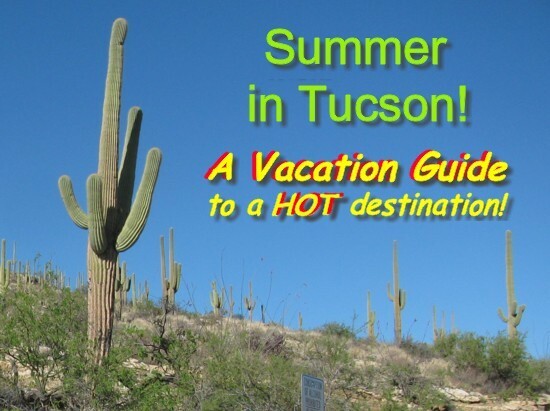 Air conditioning is almost universally found in Tucson's many hotels and resorts, most of which feature deeply discounted summer rates. 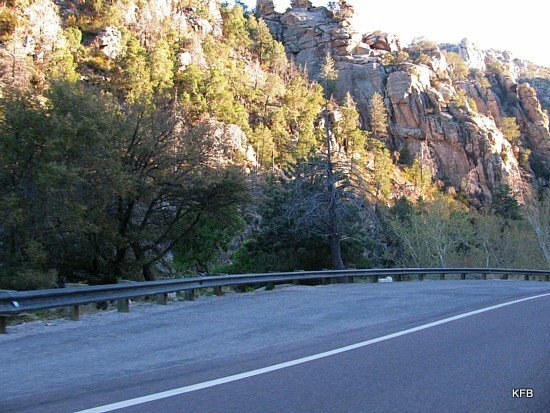 Or you can knock twenty to thirty degrees of the summer heat with a drive up Mount Lemmon Highway, to the sky islands of the Santa Catalina Mountains. Postscript: I was going to do a second entry to finish up, really I was, but it's been so miserably hot and humid all week the I couldn't keep the joke going. See, when the monsoon rain really gets going, it's going to be fun, watching the dramatic weather and feeling the temperature drop and photographing the flooding. But so far in this year's this monsoon, which just started, it haven;t rained much, and hasn't flooded at all. It's just hot and humid and miserable. I took the dogs up Mt. Lemmon Highway this evening, partly to try to find more wildlife to photograph, but mostly to avoid exercising poor, furry Pepper in 106 degree heat. We had a good time, but we didn't see any wildlife other than the flies both dogs were snapping at. Still, we knew there were larger critters in the area - or, at least, that there had been. We started out from the house around 6:30 PM. "It's a mistake," John warned. "It will be dark by the time you get up there." I assured him that we were only going as far as Molino Basin, about five miles up, and that anyway, it doesn't get dark until 8 PM these days. The car thermometer said 106 degrees as we left the driveway. The dogs rode the whole way up in the front seat beside me, taking advantage of the car A/C. 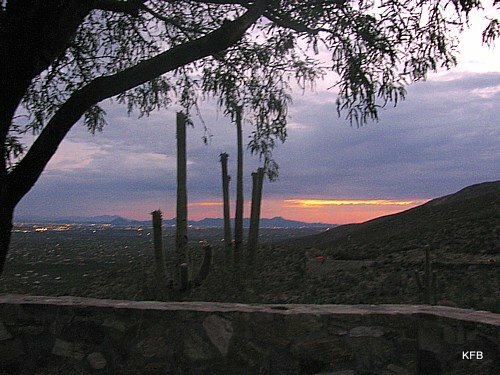 The first stop for me on Mount Lemmon Highway, traditionally, is Babad Do'Ag Vista, the first real vista point and a major destination for watching and photographing sunsets. The sun was setting, but we didn't stop until Thimble Peak Vista. The dogs got out, briefly, but there was no place for them to walk, particularly, and no wildlife to be seen. As it happened I did not stop at Molino Basin, because it had a self-serve fee station for use (picnicking or hiking or camping). I didn't want to pay, and I didn't want to cheat. 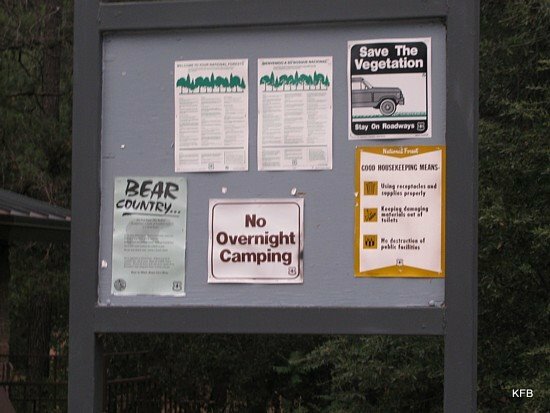 In the end we stopped at Bear Wallow or whatever it's called, a picnic area at Bear Canyon. That was probably something to pay a fee for as well, but I rationalized that we weren't picnicking or camping or hiking, and we weren't there all that long, perhaps 20 minutes. 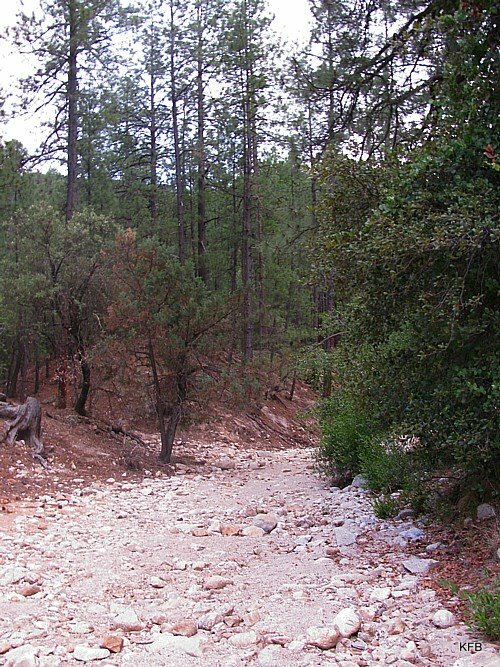 It's at this point on the drive up the Catalinas when the pine forests begin, a major contrast to the desert floor below. The temperature, according to the car, was 85 degrees. Alert for signs of wildlife, the dogs are on the hunt. Well, I heard lots of birds in the tall trees, and a little distant scrabbling that could have been a ground squirrel, perhaps something a bit larger. But the only living creatures we saw were the flies the dogs were snapping at. Still, they had a good time sniffing all the interesting smells, and Cayenne insisted that the grass up there made mighty fine eatin'. A very different wash (dry creek bed). 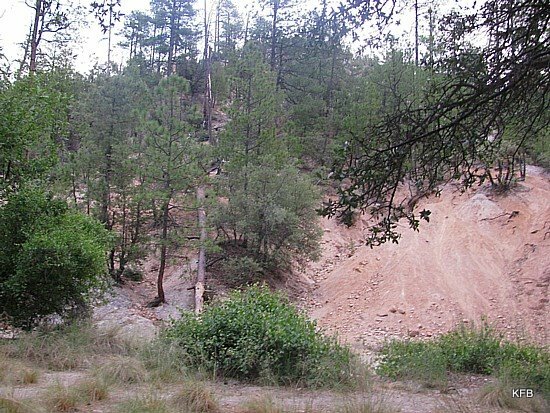 At the back of that particular picnic area, just before the steep hill, is a wash that looks very different from the ones in town. The rocks are pretty much the same, but it's not broken up with imported sand or slabs of concrete, or half-ruined with illegally dumped trash. The vegetation surrounding it is very different, of course, and you can't see far along it in either direction as it curves its way down the mountain. 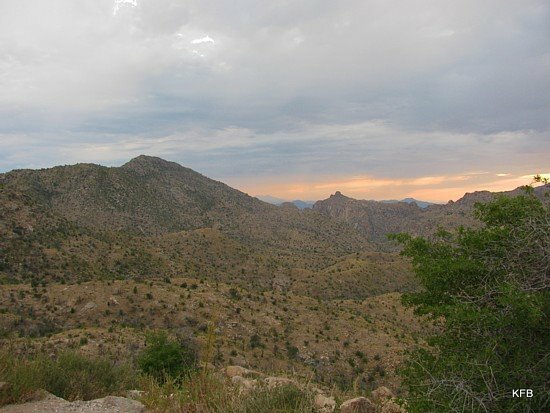 Bear Canyon does in fact have the occasional bear sighting, but in 23 years of visits to the Catalinas I've yet to see one. Just as well, really. John would prefer that the dogs not encounter so much as a rock squirrel, in case it turns out to be rabid. Babad Do'Ag, overlooking the city at dusk. On the way down the mountain, we stopped at Babad Do'Ag anyway, to catch the end of sunset and the beginning of dusk. It was 8 PM as we left. The dogs did more energetic sniffing, and even I could smell that a wild animal had visited, namely a skunk. There are four species of skunks in Southern AZ, if I recall correctly, but I haven't seen one in years and years. And when I did, nothing bad happened. So there. Note to self: having the dogs along is not conducive to getting good close-up shots of wild animals. 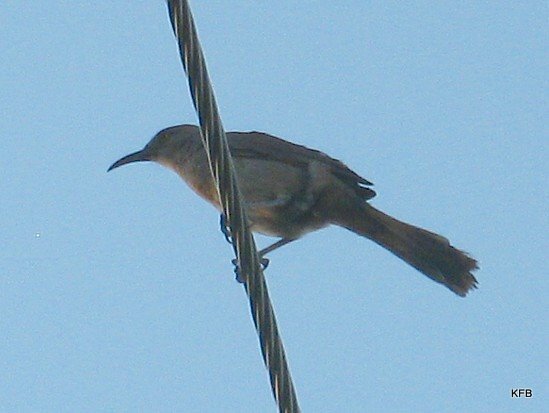 A curve-billed thrasher. Not a bunny. But I tried. 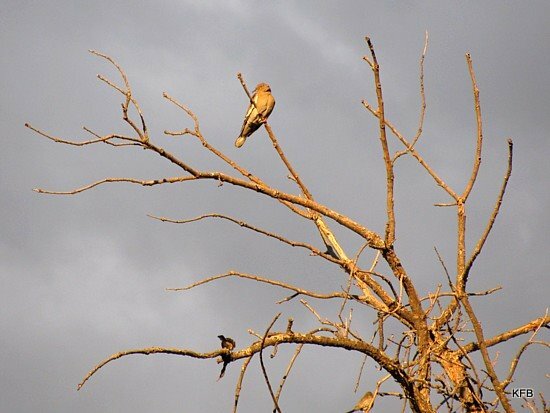 For this week's Round Robin Photo Challenge, "Wildlife," as suggested by Nancy of Nancy Luvs Pix, I originally intended to go into the mountains, or to Sabino Canyon; but I ran out of time. (I may yet do this later this weekend.) Instead, per John's suggestion, I took the dogs to the wash, and looked for bunnies there. but as hard to photograph with dogs in tow. Wait a sec, you may be saying. The wash? Alamo Wash on Friday evening. I never heard of this meaning for that word either, until we moved to Tucson in 1986. 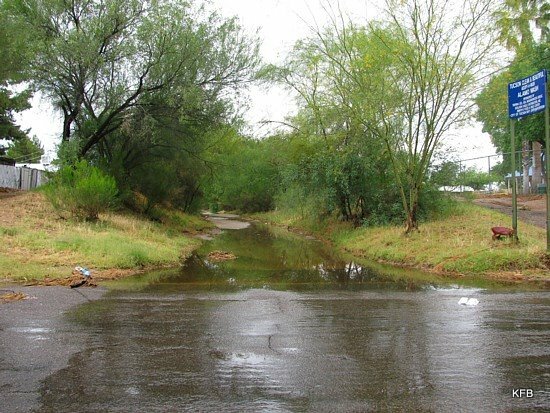 A wash is a river or creek bed that is dry most of the time, but fills up with water during storms, especially during the monsoon (rainy season). The other name for a wash is arroyo. 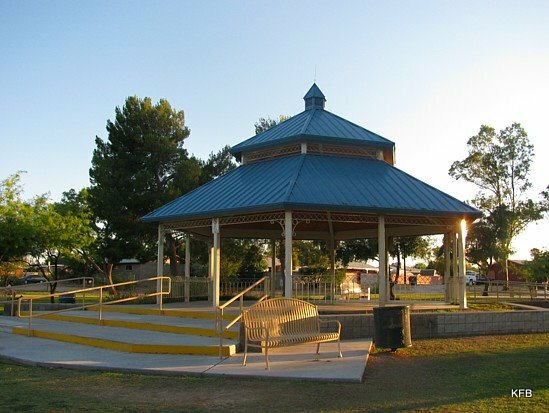 The one nearest our house, the Alamo Wash, runs north and south through many Tucson neighborhoods, including a stretch between the athletic fields of Palo Verde High School and Terra del Sol Park. That's where I took the camera and the dogs on Friday afternoon. I should have brought fresh batteries for the camera as well. Also not a bunny. 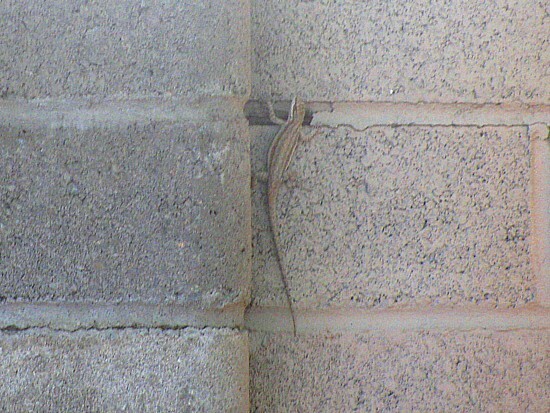 Lizards are ubiquitous here, and nothing to fear. 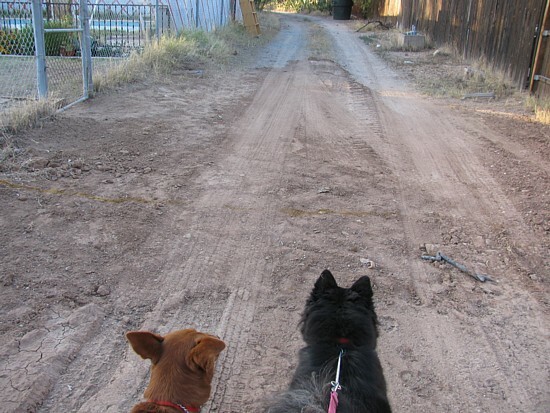 I first took the dogs for a walk along the alley that edges Alamo Wash two weeks ago, on June 13th. The thrasher photo is from a few days after that. I wanted to find you something besides birds, because I've been photographing lots of birds lately and because I personally prefer mammals. 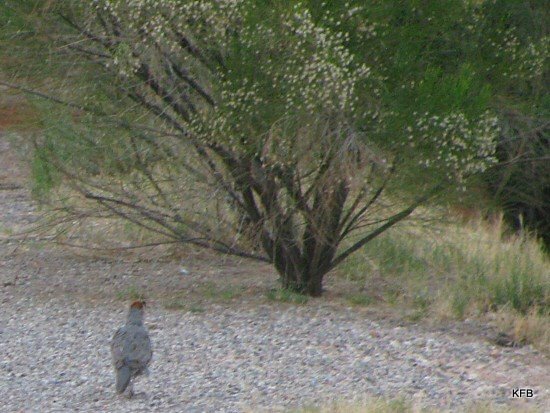 In theory, our neighborhood has coyotes and desert cottontails, a smattering of bird species (mostly doves), lizards and various insects. 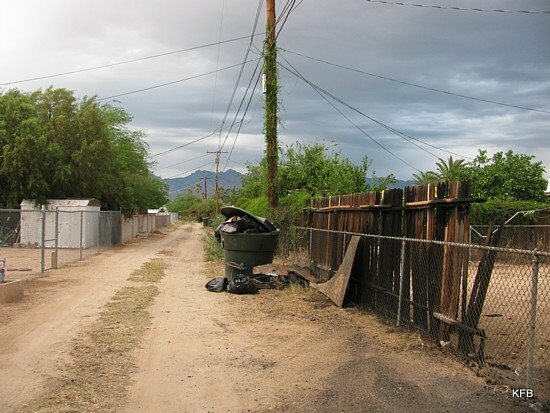 This is a 50-year-old neighborhood in an established part of the city, so we can't expects bobcats or javalinas, chuckwallas or gila monsters. 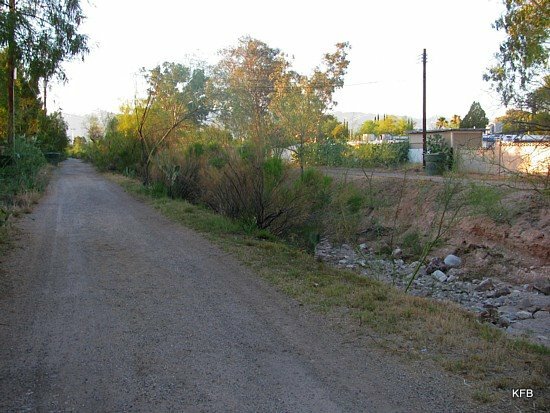 Still, the wash and the two alleyways that edge it, one on each side, are as close to nature as I'm likely to get without driving to the mountains. So that's where we went, up one alley and down the other. I did take the dogs briefly into the wash itself, but didn't like the footing given my history of sprained and broken ankles. Look! A bunny! 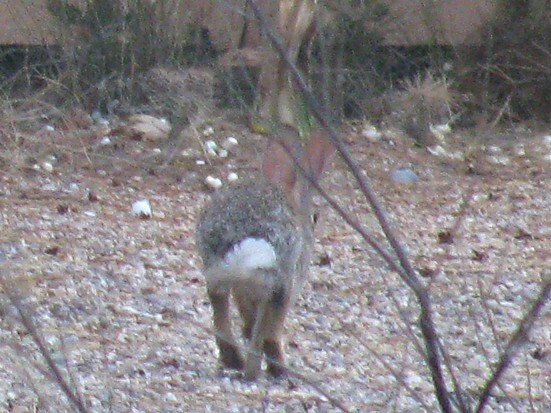 Technically it's a desert cottontail. 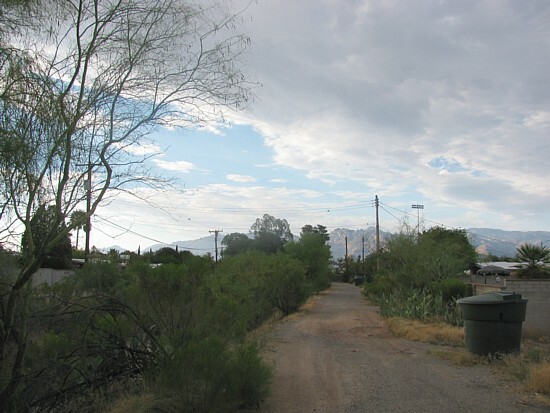 Even the desert creatures known to live in and around the Terra del Sol neighborhood are not too likely to turn up late on a Friday afternoon, They're especially unlikely to come in camera range of a woman with two dogs on leashes. At first it looked as though I wasn't going to see anything but doves and a few other birds. Ten minutes in, I actually said, "This isn't a happening thing, puppies. I don't think we're going to see any bunnies today. Oh! There's a bunny!" 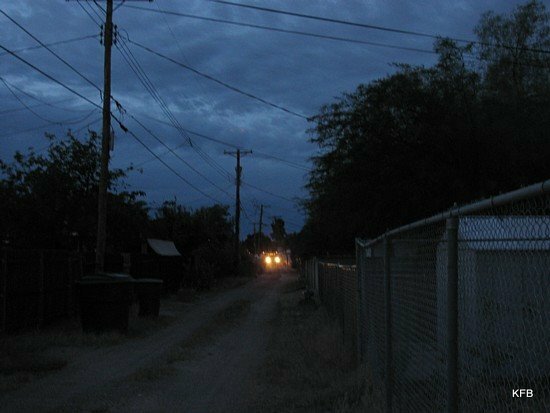 The bunny was far away, and ran down the wash and up the other side to the other alley, taking refuge in the same place I saw one go ten days before. But I zoomed the camera where I thought he was, and got the photo you see above. I've done much better with wildlife photos in the past. John and I got some great pictures of a wide variety of critters in our other house in the 1980s, in a much less domesticated neighborhood near the Tucson Mountains. I've also photographed rabbits and pronghorns in New Mexico, and lots of birds in Reid Park. But I didn't want to settle for Reid or reruns this time, so the photos above will have to do for now. I'll try to top them before the weekend is over. Meanwhile, let's take a look at the other Robins' wildlife photos! Vicki **Welcome, New Member** - Posted! I'll catch up with everyone after I've slept some more. See you later! Michael Jackson's death inspires this week's assignment. Weekend Assignment #273: The death of Michael Jackson has provoked a huge reaction, much of it from people who grew up listening to his music. Is there a particular musician whose work has particular meaning for you? Extra Credit: What is your personal reaction, if any, to the death of Michael Jackson? I vaguely remember the Jackson 5 cartoon show, and listening to Ben on the car radio; so I guess you could say I grew up with the music of Michael Jackson. When I worked for McDonald's in 1979-1980, I remember proposing my opinion that Michael Jackson would benefit psychologically from being made to work anonymously at McDonald's for a month, to get some idea what the real world is like. I still believe that premise, that a celebrity who creates an artificial world around himself to the exclusion of the real world only exacerbates any self-destructive tendencies. John always said that a celebrity who has survived fame and come out psychologically healthy could do a good consulting business helping new celebs avoid the all-too-common pitfalls of drugs, ego, and money issues. A few years later, as an employee of Buzzard's Nest records, I sold a heck of a lot of Thriller LPs and cassettes, and listened to the promo copy daily for a while. I later listened to our promo of the Jacksons LP Victory, but was less than impressed by that one. 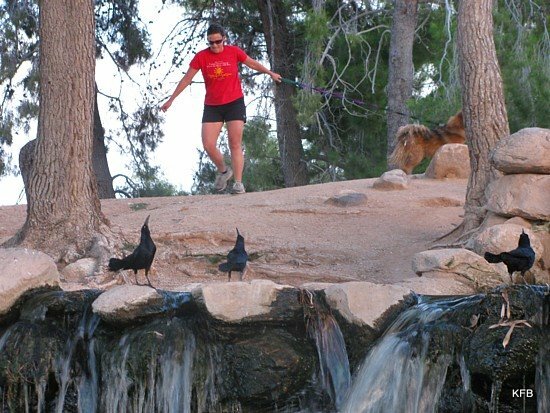 Thursday evening I left the constant Michael Jackson coverage behind on tv and headed to Reid Park with the dogs. 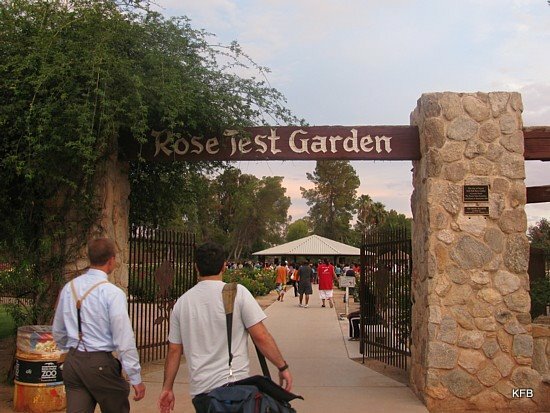 As we passed the rose garden, I saw more people there than was usual for that time of day. That's when I noticed the four trucks from three local Clear Channel radio stations in the parking lot, soon joined by news trucks from two tv stations. More people started arriving in the rose garden, and sure enough, the gazebo was soon draped in KRQ banners. 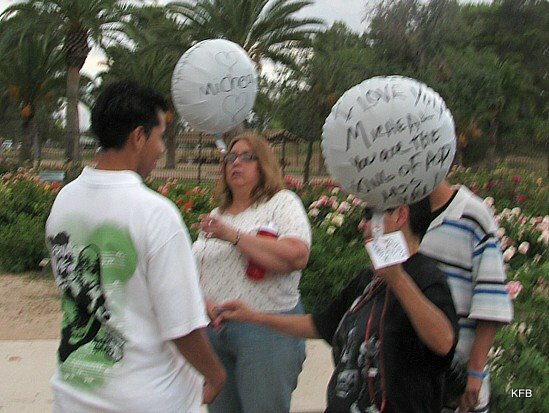 A trio of people stood with white party balloons, on which they had written in Sharpie. "I LOVE YOU, MICHEAL" was one of the things written on them. Ah. of course. As we left, someone had just addressed the crowd about having gotten his single parent mom to buy him a tape of BAD. Then they played the song Thriller, which is still stuck in my head. Darn it. 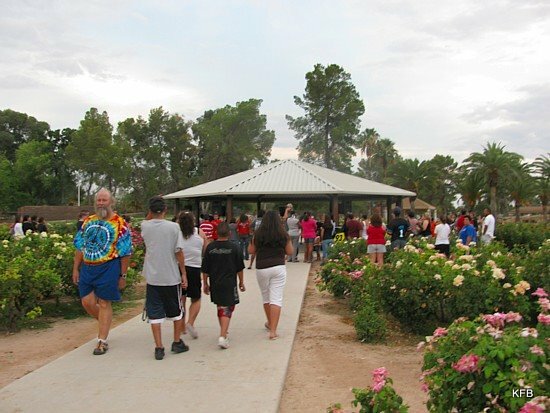 It was a typically diverse Tucson crowd - black, white, Hispanic, kids and baby boomers, man and women. Nobody was crying, or seemed particularly upset. At least one guy in his forties was standing just outside the rose garden with his young family, a vinyl LP under his arm. But the few words I heard as I walked by seemed to be about a trip to a local casino. I have to wonder what December 8, 1980 would have been like given 2009's technological zeitgeist. I will never forget the death of John Lennon, whose murder provoked a similar reaction but in less high-tech terms. John Lennon and his three chums from Liverpool have been a significant part of my life since 1964, a hundred or a thousand times more so than Michael Jackson. I did a project on the Beatles' music for school in 1973 or so, spent high school collecting their albums, drove across town to get a McCartney LP the day it came out, wrote to Yoko after her husband's death, and eventually saw Paul and Ringo in their respective concerts in Los Angeles in the 1980s. I was a record store owner-manager when John died, and handed out free buttons in commemoration the next day. (I think I've written about this part of it before, so let's move on.) John Lennon's death was as sudden as Jackson's, and more extreme, horrible and unforeseeable in its circumstances. And like Michael Jackson, John Lennon was a complex and interesting person in his public persona. But that's not strictly relevant to John Lennon's musical impact. I'm not one of those Beatles fans who idolize Lennon and discount the other Beatles' contributions. Paul McCartney was and is at least as talented. They complemented each other musically, and pushed each other to collaborations that were better than anything they each did alone. George was no slouch, and Ringo did his part; each deserves more appreciation than they get. But without John Lennon, I doubt that we'd all know and appreciate his friends to the extent that we do, even today. 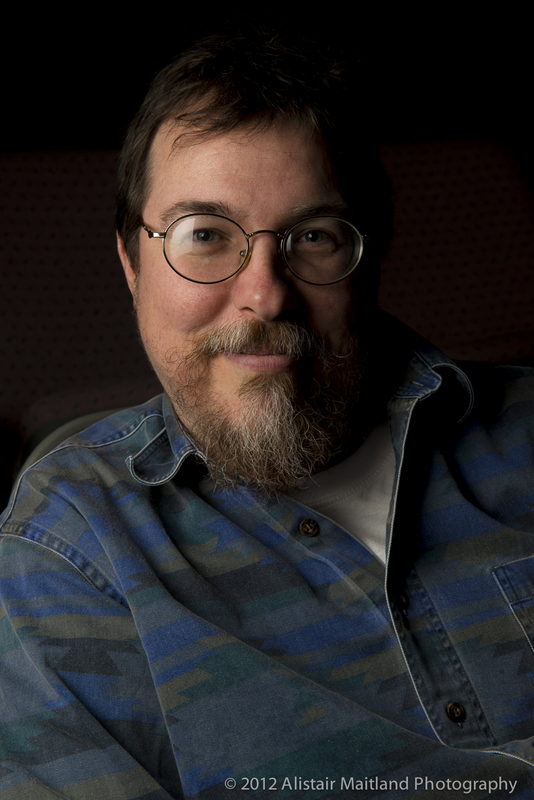 He was the one who put together the band, and instigated many of the Beatles' musical and technically innovations. 45 years after their breakthrough U.S. tours, what John, Paul, George and Ringo did still matters. Vacation? What's that? Oh, I could use a few days off, but it ain't gonna happen anytime soon. We're so swamped right now that getting away for more than a weekend is problematic. And even then it's a weekend combined with something else, like a convention appearance for me or a bowling tournament for Chris. School is out for the summer now, and families will be looking for ways to keep the kids busy until it starts back up again a week or so before Labor Day. My family is no exception. 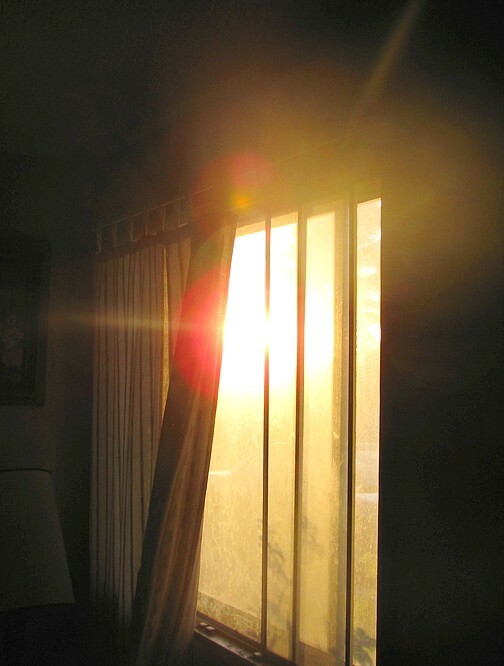 The summer days in Simi Valley can get very hot and dry, but thanks to low humidity, the nights are usually pretty comfortable. However, my husband doesn't have a high tolerance for the heat, despite having lived in Southern California all of his life, so we tend to seek out air-conditioned indoor activities during the day. We'll be going to the movies a lot, or staying in to watch DVDs. This year, we want to try to make one or two trips to the beach - the nearest one is only about thirty miles away - and to use the neighborhood swimming pool. Simi Valley Town Center is an outdoor mall, so if we have shopping to do on really warm days, we'll probably go to the indoor mall in neighboring Thousand Oaks. Well, as you can see from my last few posts, we've already taken our summer trip. We went to Walt Disney World to see the parks and sweat as much as possible. It was a good time! That is not the norm, however. This year was our first big vacation since we had kids. (Our son is seven by the way). Jenn and I have done little weekend trips on occasion, but this was the first time we went all out on a family vacation. And, based on the cost, it's a good thing we waited this long. I need to find a place that gives the best price for plasma donations, any recommendations? That's it for now! I'm rushing off to do a photo shoot for later tonight, but will be making the rounds properly over the next day or so - this time for sure! As always, I'm looking for suggestions for future Weekend Assignments, but at the moment I'm especially looking for participants to write the entries. Thanks! I've been planning this entry for a week or two, and now I'm going to rush it because I'm waiting for a nurse to call with news that a friend is ready to be picked up from outpatient surgery at a hospital on the other side of town (St. Mary's, fact fans!). After that I'm due at at St. Michael's, and I'm already stressed about getting J. home and still getting to work on time. Plus I have to call that prospective second employer, who didn't call me back last week, but I don't want to tie up the cell phone. So there's that. There was a dog owner, S., whose dog never really warmed up to me, or anyone other than S., really. I photographed her dog a few times, including for my April Fool's Day entry in which I claimed to have adopted five more dogs and given them all spice-related names. Early in Holy Week, S. and her dog were there as usual, and S. ended our chat with "See you tomorrow," to which I replied, "Probably." I have not seen either the dog or owner since then. I worry that something happened to S. or the dog. My hope is that S.'s schedule changed at work, and everything is fine. But every time I'm at the dog park and she's not there, I worry a little more. 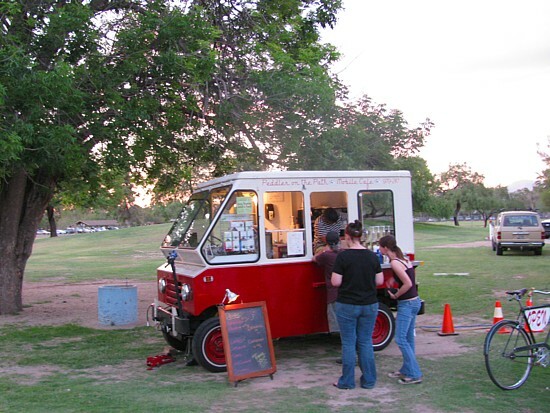 A colorful food vendor truck at the performance center. Most of the encounters are briefer and more light-hearted. There was the time I walked past a tall man and a short woman, practicing slow dancing next to the duck pond, without music. The man was instructing his partner on a waltz step or somesuch. 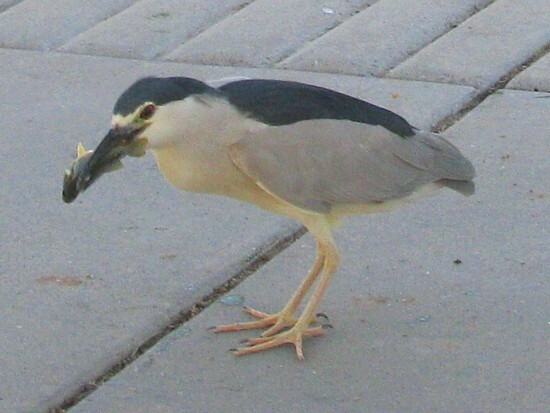 There was a woman who asked me what all the birds were in a certain tree (Black-crowned Night Herons), and correctly deduced that the speckled one was an immature bird of the same species. 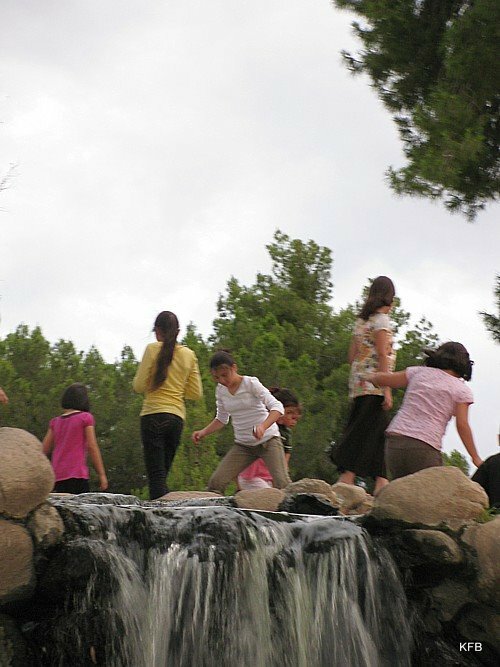 There was the tween-age girl who confided that she was carrying tadpoles in a cup. And there's a little man from Parks & Rec, part of whose job is to politely shoo people out of the rose garden at 7 PM or sunset, whichever is earlier. I didn't give him grief the first time I met him, even though I needed a rose picture for a photo shoot and couldn't go in to take one. Now we always smile and say hi as we pass each other on our respective rounds. Then there are the kids, inevitably reacting to my two dogs. Some are frightened, and I try to reassure them that they are nice dogs if you're not mean to them. 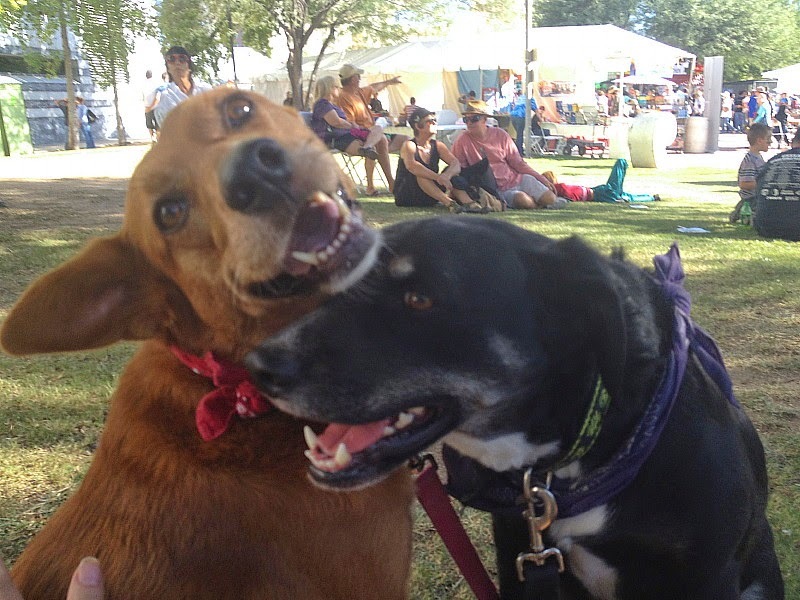 Some exclaim excitedly to their parents, and want to rush over to pet the doggie. If the parent tries to frighten the kid away, I try to balance their instruction with the same reassurance I give the frightened kids, but in either case I don't encourage them to approach the dogs. Cayenne is not all that great with children, who may approach too quickly, hand out in what Cayenne seems to think may be an attack. Pepper is much more relaxed about this, and I must say that the children who are slow and gentle about it seem to be delighted with the result. Even Cayenne will tolerate the occasional child - and she's great with her adult admirers, demanding extensive petting at times. Another jaunt down a neighborhood alleyway. Walking around the neighborhood, I don't see many people, and speak to even fewer of them. My most recent contect with our next door neighbors was at a toy show a couple of months ago. I've chatted a little with the lady across the street, who has cancer, and who also has a sweet golden retriever. I've said hello to a few other neighbors as we go by. And the other night I came across a young adult teaching a girl to ride a bicycle, accompanied by several other kids. I had the usual back and forth with the kids, giving the dogs' names and supervising a moment of petting. The young adult (big sister, probably) didn't say a word. There was also the child in a house the next street over, shouting to his mom as we passed by on the sidewalk. "Mom! There are two really pretty dogs in the front yard!" I heard no reply, and to my slight disappointment, the kid didn;t come out for a closer look. "Do you hear that, fuzzheads?" I told the dogs. "People think you're pretty." The dogs, who hasn't seen or smelled anything or interest, continued down the sidewalk without comment. --from One Fish, Two Fish, Red Fish, Blue Fish by Dr. Seuss. 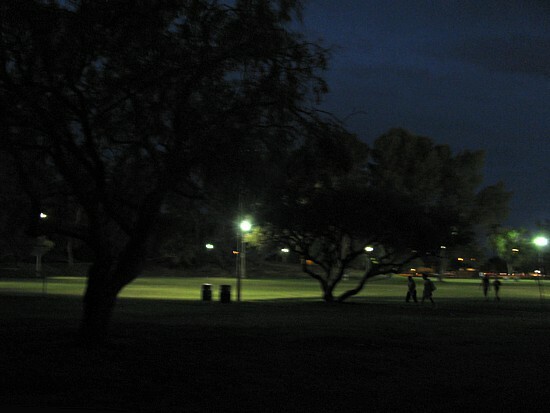 People sometimes play softball beneath these lights. 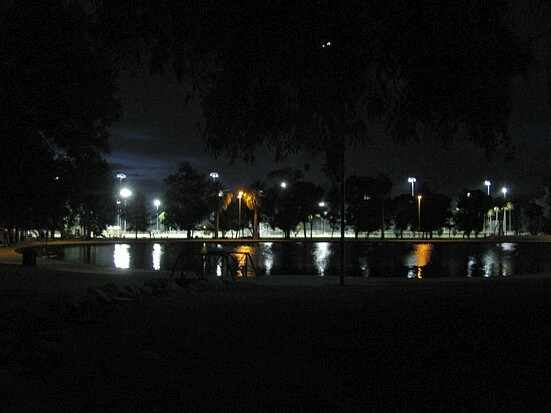 I don't have much to say about this short set of photos, except that I took the dogs to Reid Park at dusk one day last week, partly because we were delayed in setting out, and partly as an excuse to experiment with night photography. John's been agitating for dinner before dog park instead of after, which tends to push the interspecies gallivanting toward sunset or later. Most of the time when this happens, we end up exploring the neighborhood to avoid wasting time on the drive. But on June 17th, I drove across town anyway. The other urban lake, with baseball fields behind it. I took quite a few other shots, most of which are rather terrible. But these came out pretty well, I think. For the latest Ellipsis Monday Photo Shoot, Carly wants to see stars - literal, stylized, metaphorical or what-have-you. That's not easy for me. My camera isn't really capable of photographing stars, at least not as operated by me. I can't think of any neat star designs in the house, unless you count a sunburst clock that I've photographed a number of times already and that I think we gave away many months ago. And although I've interviewed quite a few actors over the years, I've photographed very few of them, and fewer still count as stars rather than character actors, particularly in the U.S. Still, the game is to meet the challenge of these photo shoots, however difficult, so I tried. I started by photographing the only star that shows up readily on my digital camera's viewfinder: our own sun. I photographed it from inside the house first (above) and then stepped outside. There I photographed it through the branches of that big tree of the street, but it's not a good or interesting photo so I'll spare you that one. Several hours later, I took the camera outside, fiddled with the settings (I tried both Auto and Night Portrait) and turned on the timer to avoid camera shake. Then I set it down on the roof of my parked car, the lens pointed straight up.  I was sure that all I got was black on black, but with much tone adjustment, brightening and contrast I believe it's showing several actual stars, or possibly planets, or both. The result is not an aesthetically pleasing photo, but I'm impressed that the camera captured anything in the sky at all. On the other hand, if I brighten it further I get many more "stars." 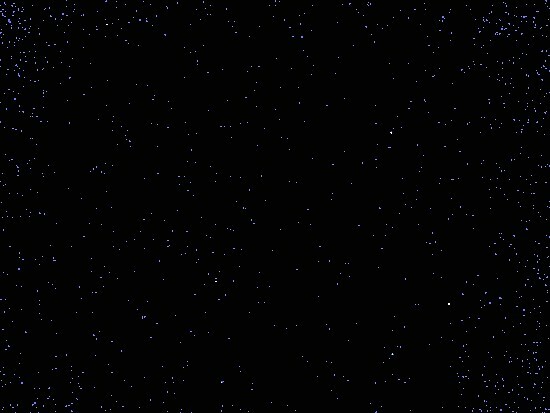 At this point it's hard to avoid the conclusion that they aren't stars at all, but camera noise. I've done a bunch of photo editing over the past 14 hours, preparatory to launching myself back into daily blogging - I hope! Next time will probably be either one I'm calling "Brief Encounters" or an entirely different essay, working title "Into The Night." I'll be back with one of those - or perhaps something completely unrelated - on Tuesday night, probably after midnight. Weekend Assignment #272: Here Comes Summer! I bet you thought I forgot to post the Weekend Assignment, didn't you? Actually I was holding off last night and today, hoping to get last-minute participation in last week's assignment. It didn't happen, so it's time to move on, ready or not! This week, guest professor Carly has a few questions for you, slightly tweaked and expounded on by yours truly. Weekend Assignment #272: What are your plans for the summer months? Do things get busier for you this time of year, or slow down? Do you go on vacation, or stick close to home? Extra Credit: Do you do much summer TV viewing? Is there anything in particular you're looking forward to watching? For me, Summer 2009 looks to be a slight variation on Spring 2009. I am finally working again, but only part time, and other job prospects have not panned out so far. There is no time or money for travel, obviously. It looked for a while as if I were going to get up to Phoenix for one day this past week to learn the Church Windows software, but the seminar was canceled. It will now apparently be offered online instead. That sounds fairly practical, but won't be as much fun! One thing I am looking forward to is the monsoon. Every year when the rain hits, there are lots of dramatic photographic opportunities. 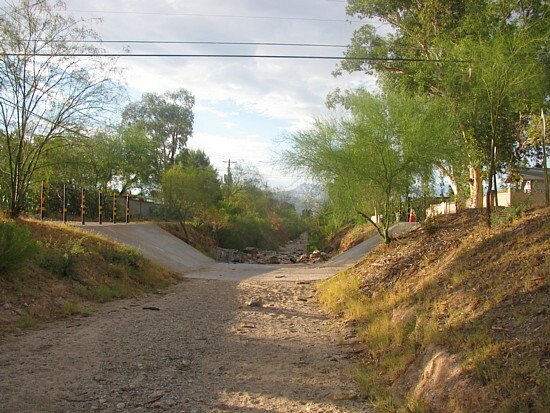 Expect to see photos of clouds, rainbows, torrential downpours, flooded streets and rushing water in rivers and washes that are bone dry the rest of the year. When I got up late this morning it was raining and I got my hopes up, but it dried out on the afternoon. No matter: it's too soon to expect the formal monsoon. But in a couple of weeks, watch out! This year's hunt for great monsoon photos will be slightly complicated by my ongoing attempts to keep the dogs amused. It will be interesting to see their reactions when we start gallivanting in the rain together. Meanwhile at home, I'm near the end of my second CPA review online seminar, which basically consists of assigning a set of units to be completed and the online tests passed every three days. I've got about 5 more units due three days ago, and another 5 or 6 due in 24 hours and seven minutes. After I finish "REG" (Regulation) I'll take a few days off and then start on my third section. As for television, I haven't been watching much other than Keith and Rachel on MSNBC. 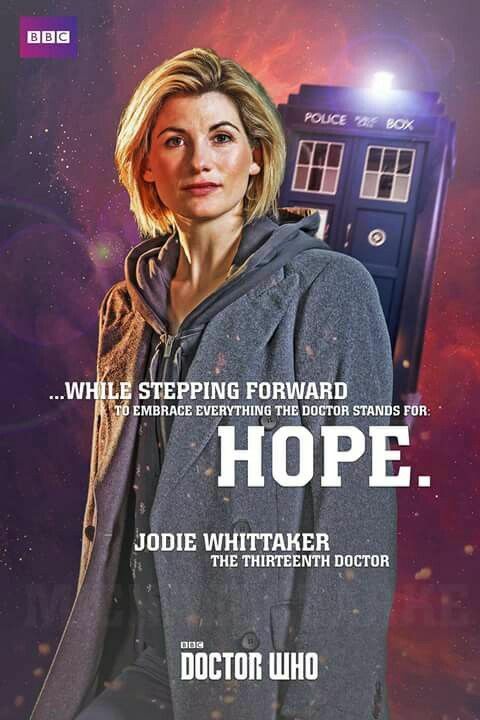 To be honest, I don't expect that to change for a while - unless, of course, I embark on a Doctor Who or Buffy marathon. So how's the weather here? 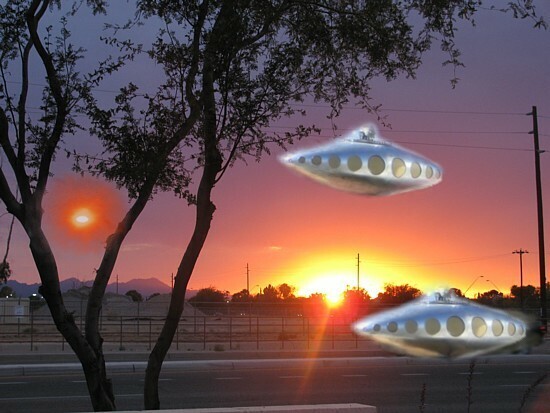 Pardon me while I look outside. I'm not kidding. We have a saying here that if you don't like the weather in Texas, just wait a few minutes. The summers are generally hot and humid, winter is changeable (90F one day, snow the next) and fall and spring tend to be changeable. While we don't live in tornado alley, we still get our share of bumpy weather. 120,000 people are still without power after a severe storm hit two days ago. Tonight there was more severe weather, but we just missed it. That's it for now! As always, I'm looking for suggestions for future Weekend Assignments, but at the moment I'm especially looking for participants to write the entries. Thanks! I'm way behind in my blogging, let alone blog-jogging. I've planned a number of entries that remain unrealized in my head. This is due to the kind of week I've been having, this week and last. I've had unusual obligations at home, several days a week working at church for a few hours each, and more CPA review coursework than I could handle. Let me tell you about it, illustrated with photos from our recent interactions with work crews from Southwest Gas. That's a big piece of the puzzle right there. It started 10 days ago, with the fire in the alleyway that I told you about last week. After the first of the Southwest Gas employees showed up at our door about 4:30 AM, and (eventually) discovered a gas leak in our back yard, I took this shot of activity still going on in the alley where the fire had been. All day the next day, there were Southwest Gas people all over Calle Mumble and adjacent streets. 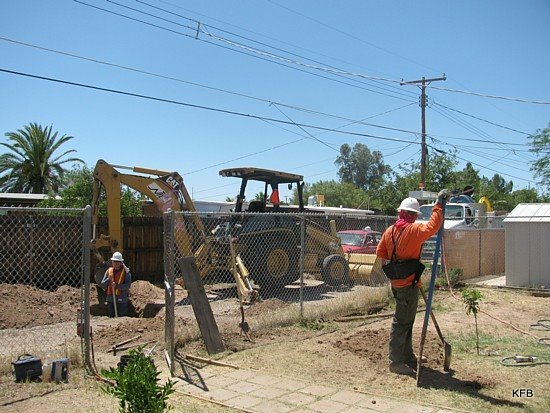 That was the day I interviewed three plumbers and a Southwest Gas engineer about replacing the gas line and possibly moving the meter up to the house. 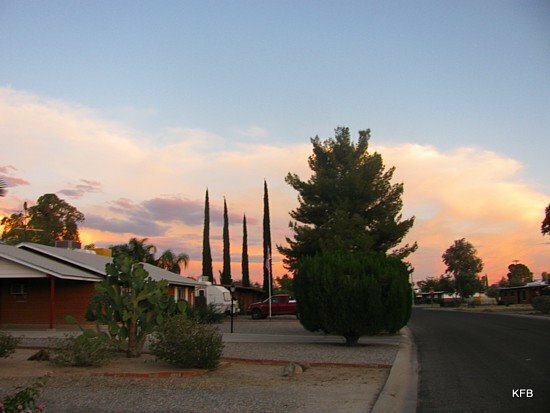 We decided on having Southwest Gas do to work, for a number of good reasons I explained in a previous blog entry. The day after that, I dropped off the contract at Southwest Gas before going in to start training for my new position at St. Michael's. 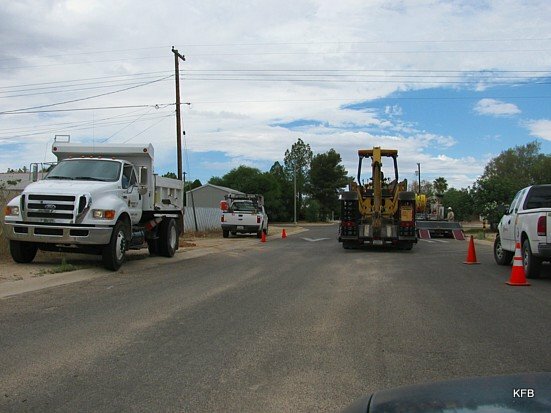 The actual work of installing the gas line and moving the meter was scheduled for Monday the 15th. Over the next several days I took the dogs for a walk in the alley a few times, and photographed the remains of a neighbor's fence where the fire was. (The rest of the wooden fence has since been pulled down.) I also worked a few afternoons, and left two voicemails in response to a missed call from my other prospective employer for a second part time job. On Friday he called back, and set up a second interview for Tuesday the 16th. Meanwhile, John did some serious yard work over the weekend, in the grand tradition of "cleaning up for the maid." And of course I had Round Robin duties, but was too busy to make the rounds of people's entries. Sunday night I was up until after 4 AM, working on my CPA review assignments, trying to get caught up to where I was "only" three days behind. Monday morning arrived too soon, when the Southwest Gas crew arrived at 6:30 AM. I was awake and busy all day on a few hours of sleep. When I wasn't checking in with the work crew (which was complicated by the fact that I kept ending up talking to a particular guy who spoke very little English), I was dealing with computer problems, going in to work at church, taking the dogs up the street for a little discreet peeing, and getting another call from the prospective second employer, postponing my second interview to some undetermined future date. Oh, and I found out that the software training sessions I'd hoped to attend in Phoenix on Wednesday had been canceled. When I discovered that I left my first paycheck behind at work, I went home, tracked down my proof of citizenship for my I-9, and headed back to church, briefly. I intended to attend a meeting there at 6 PM, but at that hour the gas guys were still at the house and John had just gotten home, so I was bringing him up to date on things. At 7 PM I was at the dog park, preparing to take photos for the Ellipsis Monday Photo Shoot, when my phone rang. Only I didn't know that at first, because it was the "other" ringer, the one the phone uses when Caller ID is blocked. By the time I answered, I had missed the call and had to call voicemail. There was already a message I hadn't listened to yet. It implied that a friend was being evicted, and asked for help finding packing boxes. The second voicemail was from my co-worker at church, rescheduling our next session. I listened to her message three times, trying to memorize the phone number she gave. When I dialed it back, I got the voicemail of the friend who needed boxes, presumably because I'd failed to exit the voicemail system. All this time I was standing over Pepper's dog park mess, unable to clean it up because I was too busy fiddling with the phone! I did reach my co-worker eventually, and my friend called and she's not evicted, although she will be moving when her lease is up. I went home and edited photos, did CPA review assignments until my brain couldn't possibly manage the task any longer, posted a slap-dash version of the EMPS entry to be expanded on later, and went the heck to bed! Early Tuesday morning the gas guys were back, but just for a few hours to finish up and clean up. Once they were gone I tried to sleep in, but got a call from Wells Fargo trying to sell us the services of a Personal Advisor, and another call on behalf of a friend I'd promised to meet with for moral support as she printed mailing labels. No, really. She bought me lunch, and I spend the rest of the day at the computer, except for another brief, unnecessary trip to church. I got more CPA review stuff done, but was more behind than ever. Wednesday, I got semi-adequate sleep, battled the computer some more (I think my Firefox build is messed up), did the deposit at church, ate lunch, bought gas, washed the car, bought dinner, and took the dogs to the dog park at dusk. There will be photos for that in a future entry. And I did a bunch more CPA review assignment stuff, and I'm STILL way behind. Then I edited these photos, and wrote this entry. And now I'm going to bed. For Ellipsis Monday Photo Shoot #42: Playing In The Water, Carly wants to see people interacting with water. I can't top my waterfall shots from Saturday, but I can update them with tonight's visitors to the Barnum Hill waterfall. Here they are. I have much more to say and probably much more to show, but it's been a very long and difficult day and I'm utterly exhausted. More later, after I've slept! Okay, it's many hours later, and I've slept. I would have slept in even more, but I had a half-forgotten appointment to meet with a friend late this morning. The thing I probably haven't made clear about the water than flows in manmade streams from the top of Reid Park's Barnum Hill, down the waterfall and into the two urban lakes (duck ponds) is that all of that water is effluent - treated, "reclaimed" wastewater rather than drinking water. 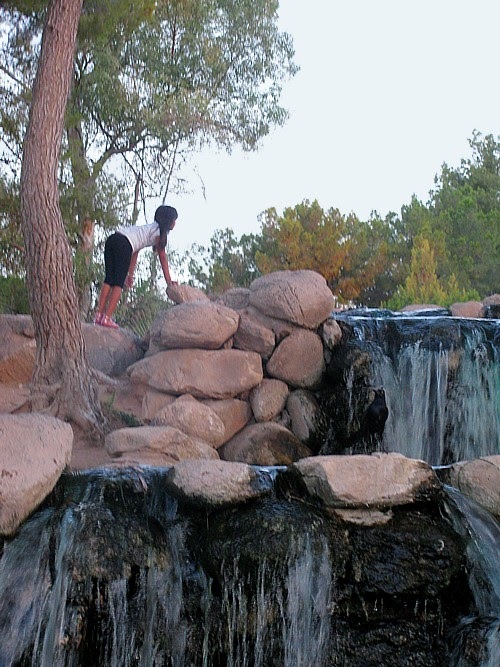 There are all sorts of sensible reasons for using reclaimed water for irrigation and other purposes in our desert city, and after all, it's not like it comes straight from a sewer. Still, it's very definitely not something you'd ever want to swim in, unless you're a bird or a fish, let alone drink from. 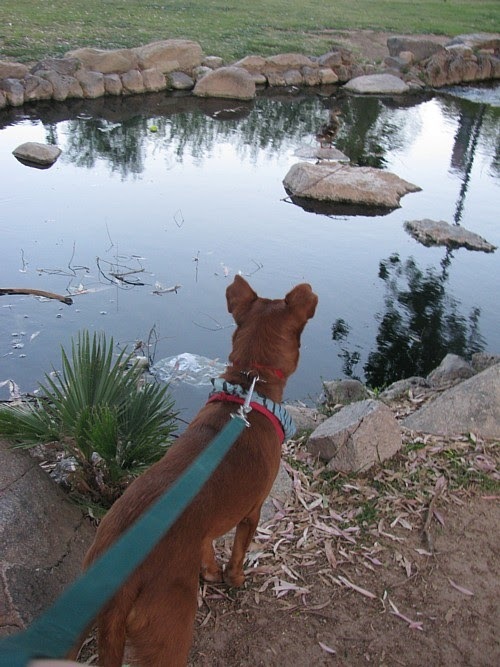 Even Cayenne, in her mania to chase ducks, discovered a few weeks ago that beneath the water's pretty surface is algae and unpleasant, smelly muck. But here's the problem. 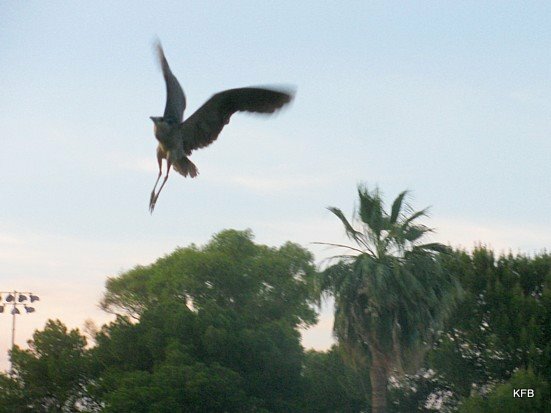 The two urban lakes are stocked with fish for the birds to live on, and despite the signs forbidding it, some humans can't resist fishing for them. The guy pictured above was pulling fish out of the water and flipping them to the herons, which seems like fairly harmless behavior. (I've made a few small edits to the picture to make him harder to identify - I don't want to get him in trouble!) But I've also seen a whole family fishing together, apparently intending to eat what they catch. This strikes me as dangerous. If fish in the Great Lakes and elsewhere became unfit for consumption in the 1970s due to mercury and other contaminants, how safe are these little fish that spend their lives in semi-treated wastewater? Better to leave the fish to the birds. And by the way, leave the birds alone, too. 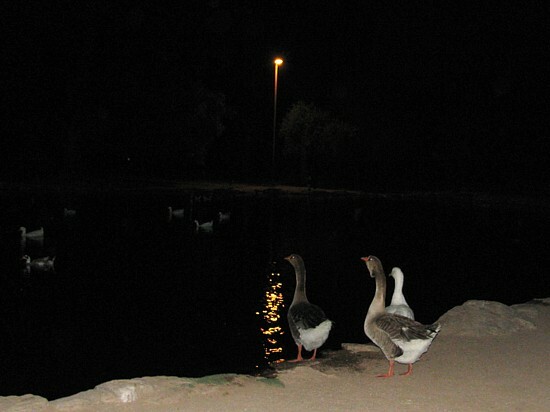 There is a rumor that at least one local restaurant was caught trapping Reid Park ducks to serve as food. The story smacks of urban legend, but there does seem to be truth to the idea that people dump ducks they don't want any more to live out their lives at Reid Park. 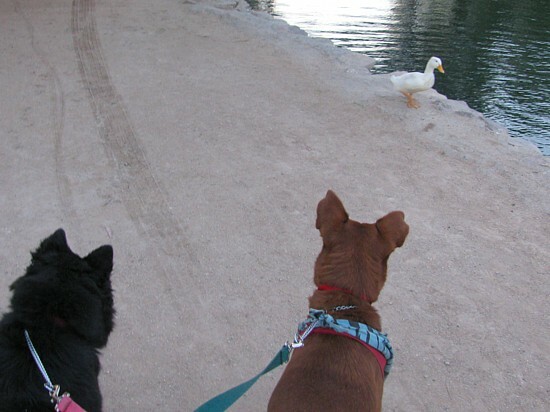 Domesticated ducks probably shouldn't be expected to suddenly fend for themselves in the wild. Better not to get your kid a live duck for Easter in the first place, hmm? In order to keep things interesting for the dogs and myself, and also to save gas, I've started taking them on walks around the neighborhood on some evenings rather than driving to Reid Park every day. 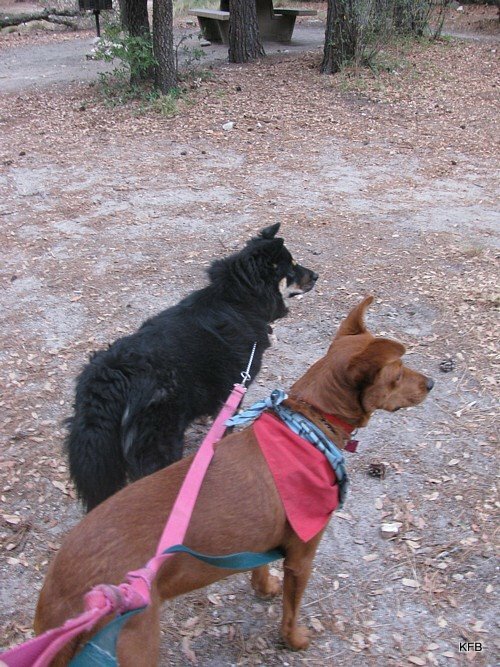 Our previous dogs, Noodle and Tuffy, rarely left Calle Mumble, either on foot or by car; but Cayenne and Pepper are more fortunate. On Saturday evening I led them to parts of the neighborhood I've never even seen before, in about 15 years of living here. Our street, Calle Mumble (not its real name) is in a neighborhood called Terra Del Sol, which I assume means Land of the Sun. Its street names all refer to stars and planets and such, all in Spanish. Many older neighborhoods in the city are laid out with curved streets and cul-de-sacs or other obstructions to discourage through traffic, and incorporate a school, a park or both. 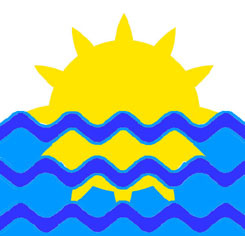 Terra Del Sol is bordered by Palo Verde High Magnet School, and has Wheeler Elementary School in the middle of it. It also has a membership-only neighborhood pool (or "aquatic center") and a little park with a gazebo. 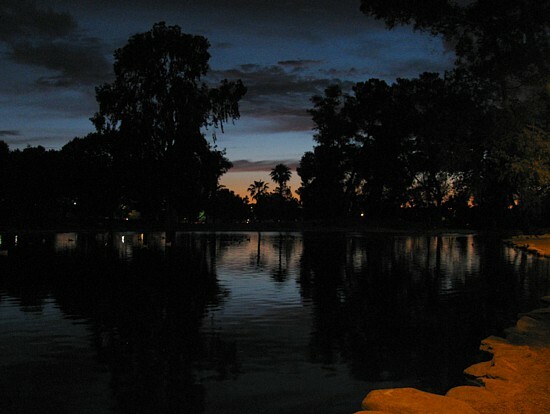 The park is several streets away from Calle Mumble. I've rarely driven past it, and certainly never visited the place until this weekend. It's not remotely comparable to Reid Park or Columbus Park or Udall Park, but it's green and pleasant. Some kids sought and were given permission to pet Pepper, but Cayenne is far more wary around children and hung back with me. They got barked at by a tiny dog and made friends with a large one, so overall it was as much doggie interaction as I could possibly expect from a little neighborhood park. After that we followed Alamo Wash all the way from the edge of the park to Calle Betelgeuse near the high school. 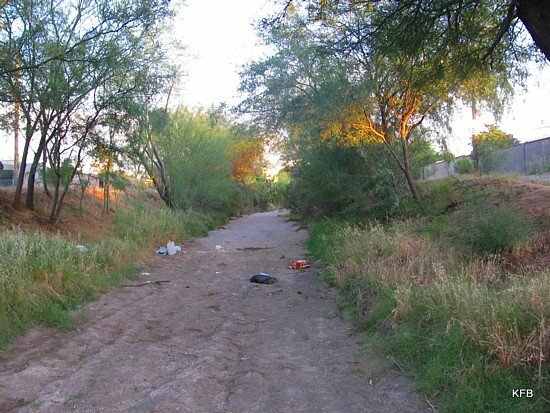 It turned out that the wash (dry creek bed) has a rather nice alley running alongside it, something I never suspected. The last time I photographed Alamo Wash it was full of water, but now it's bone dry. This is just a few feet from the spot where I photographed Pepper looking out the car window at the deep green water of Alamo Wash a few weeks ago. Even without the water it would be very pretty, had someone not used it as their personal trash heap. Perhaps I'll return with a trash bag in a day or two. Sunset that evening was subtle and rather odd-looking, but nevertheless lovely. Perhaps you remember my photos of a huge tree in our neighborhood that gets decorated at Christmas, along with the yard it's in. You can see that same tree in the shot above, with another tree in front of it. 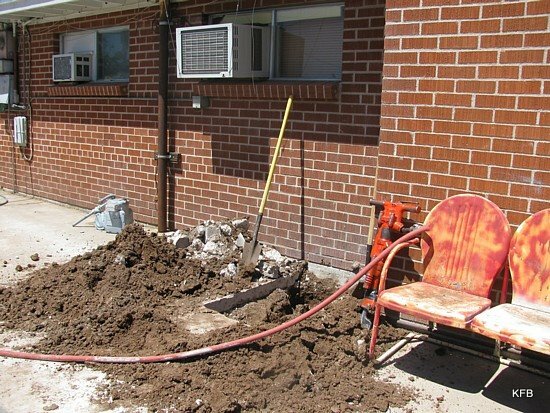 I've had computer problems and lots of CPA review course units to deal with over the last few days, and the gas company should be here not many hours from now to install the new gas line and move the meter. I also work tomorrow afternoon at church, and have a neeting at church on the evening. Nevertheless, I hope to make my rounds of your Round Robin entries over the next day or so. I had a great title lined up for my entry in response to this week's Round Robin topic. The topic itself is "Looking Up," as suggested by Robinella of the blog Robinella's. My variation was brief and elegant and clever, and went with the photos I took earlier this week. Only I can't remember that title. I've been wracking my brains for nine hours now, to no avail. Ah, well! We'll just make do with what we have. 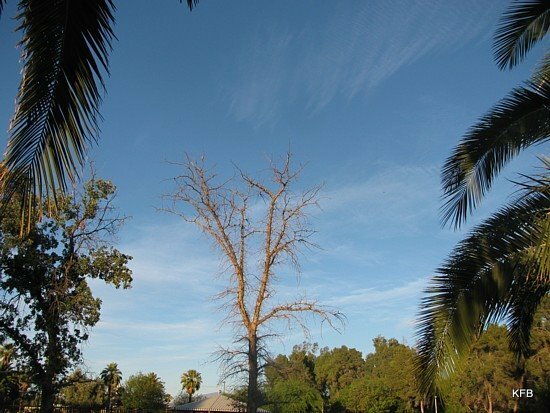 There is a very tall, very dead tree near the rose garden in Reid Park. It is very handy for birdwatching. It's high enough above the ground to attract many species of birds, and bare enough that it utterly fails to conceal them from human eyes. All I have to do is point my camera and look up. I've previously posted photos of a hawk and a couple of vermilion flycatchers in this tree, so let's skip over those for this morning. They're not the only kinds of birds I've seen in it. "Just like a white-winged dove..." because that's exactly what it is. 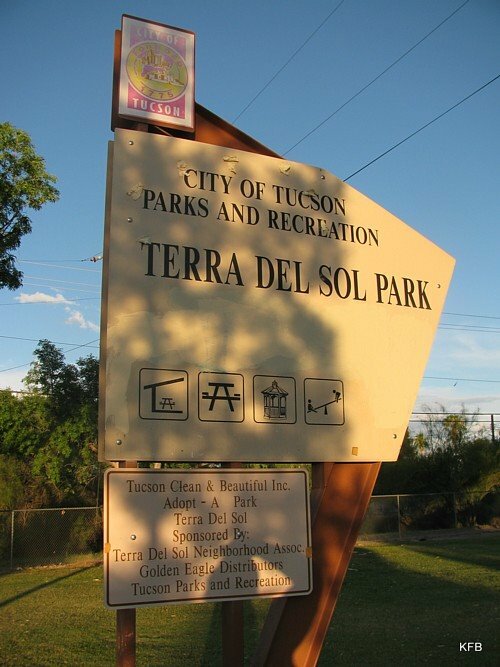 Tucson has White-winged Doves, Mourning Doves, Inca Doves (which are significantly smaller), and Rock Doves, better known as pigeons. White-winged Doves are especially common around here, and have a very distinctive song - not one worth Stevie Nicks going on about, though. I've already posted quite a few photos of Reid Park's many Black-Crowned Night Herons, and could easily post quite a few more. There's a particular tree next to one of the duck ponds that almost always has two or more of them perched in it around sunset. 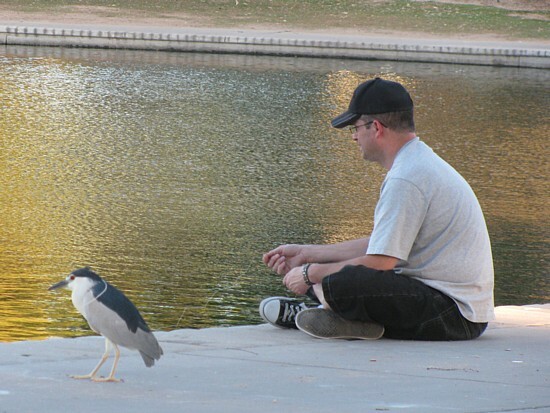 The rest of them hang out on the concrete shore, waiting for a chance at some fish. (More on that tomorrow night.) This is the first decent shot I've gotten of one of them up in the air. 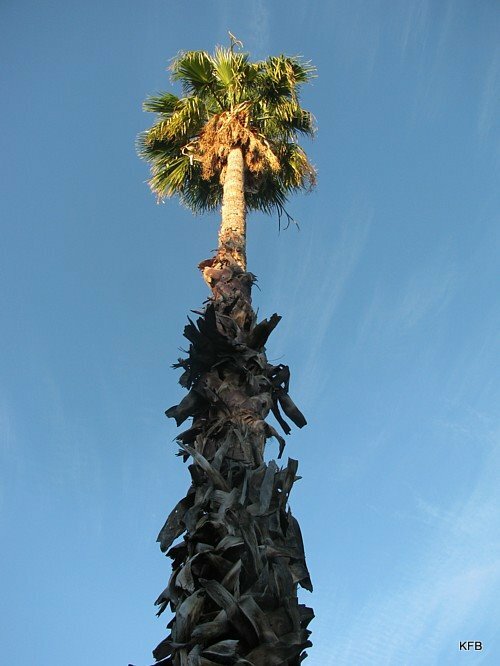 Many of the tallest trees in Tucson are palms. They aren't native but are ubiquitous anyway. Grackles seem to like them, but not many other birds turn up in them, as far as I've seen. The grackles seem to be saying, "Good grief! What now?" The woman is joyous; the dog is distracted. That's it for me for now! Let's go see everyone else's upward-looking photos! Irene **Welcome New Member** - Posted! Joanna**Welcome New Member** - Posted! Margaret**Welcome New Member** - Posted! Vicki**Welcome New Member** - Posted! Also, I'd like to make a special plea. Carly and I each have another meme, both of them started years ago by John Scalzi for the now-defunct AOL blog By the Way. Mine is the Weekend Assignment, which I was posting on Thursday nights, but it's recently slipped into Friday. Carly's is the Ellipsis Monday Photo Shoot. We'd both appreciate it if you'd check them out, especially if you normally only stop by our blogs at Round Robin time. The Weekend Assignment is a writing prompt, not a photo challenge, but I'd really like to see some Robins give it a try anyway. Especially this week. See, this week's Assignment is to introduce us to where you live, without resorting to photography. Can you do it? Will you? I hope so!